A behind-the-scenes look at the making of the new Tektronix 5 Series mixed signal oscilloscope reveals its next-generation design. As embedded systems used in everything from automobiles and airplanes to household appliances to IoT devices have gotten more complex, so too have the demands placed on test and measurement equipment. Oscilloscopes are just one example where changing technology leads to revised user expectations. Based on extensive research into the changing needs of engineers working on modern technologies, it became apparent to product planners at Tektronix that meeting these changing expectations would take more than an upgrade to its midrange oscilloscope family (between 350 MHz and 2 GHz bandwidth). A large team of electronics engineers, software developers, user interface experts and industrial designers was assembled to re-invent and re-design the oscilloscope. The new 5 Series MSO features a new ASIC, a new lower-noise front-end amplifier, a new hardware architecture, a new software architecture and a new user interface. The scope incorporates several industry firsts, including reconfigurable scope inputs, models with six or eight analog input channels, a 15.6-in. capacitive touch display, a user interface natively designed for touch, and optional Windows operating system. Below is a Q&A exchange with key members of the design team discussing the challenges they faced and how they overcame them. What led to the decision to develop a completely new platform? Gary Waldo, product planner in the mainstream oscilloscopes group: My job is to work with engineering to figure out what our next generation products need to do. There are new application needs coming along that we wanted to be able to meet that we couldn’t do with our current products and platforms. Basically, to meet the spectrum of customer needs, it was necessary to develop a new platform. Everything about this platform is brand new, including the user interface. This is the first entirely new user interface in probably 10 to 20 years, and we did it because we wanted to make the product just as simple, intuitive, and usable as possible. What can you tell us about the new ASIC? Bart Mooyman-Beck, director of technology: My team developed the chip that goes into the 5 Series MSO, a design we started about four years ago. We call the chip TEK049. It’s basically a scope on a chip. It has all the functions that are required for a scope—the ADC, the digital signal processing, the rasterization, the display formatting—this is the heart of the design. The design is a 400 million transistor design. That was a design that we had not ever done before here at Tektronix. We used resources around the world, and we were going 24 hours a day, sometimes 7 days a week. Everyone had to contribute at all levels to make this happen. The TEK049 is groundbreaking in many respects. We were able to attract top talent, because when we sent out to the world that we were developing this, people came from all over the world to say that we want to be part of this solution. The TEK049 ASIC is the heart of the 5 Series oscilloscope. With 400 million transistors, it’s easy to see why it’s called a scope on a chip. What can you tell us about FlexChannels? Gary Waldo: The goal here was to give the customer flexibility. With the traditional approach of an MSO being you either get sixteen digital channels or none, you were almost guaranteed to provide the wrong number of channels to the customer. Steve Herring, software project leader: The difference with this product is the digital was designed in from the beginning with the analog. Digital isn’t just an afterthought now. Previously, we added digital onto what had been traditionally analog scopes. The 5 Series MSO is designed from the beginning to be both analog and digital in one front end. Analog and digital are equal in this product, it’s the same front end, same signal path, same hardware, all the same software. What challenges did you face in trying to put up to eight analog channels along with up to 64 digital channels in the same space as four analog channels? Brian Mantel, hardware design lead: We managed to fit eight analog channels into a similar form factor to existing products. It was really an incredible design feat. There’s so much circuitry packed into such a small area, that alone was a massive challenge. Also, a lot of mechanical design was involved with making sure we could cool everything properly. The design team went through about $300 of copper tape in devising a mechanical shielding solution for the front-end inputs. How did you achieve low noise on the front end? Brian Mantel: Keeping noise out of the system was a particular challenge because we have an ultra sensitive front end. We started by making sure that we had a low noise design to begin with, but then afterwards we had to put the final touches on all the mechanical shielding. As we were prototyping the design, I think we went through about $300 worth of copper tape trying to shield these up. We ended up with a good, low-noise design in the end. How has the software architecture changed? Shane Arnold, software architect: FlexChannels was probably the most significant impact on the software architecture. The configurability of FlexChannels was an opportunity to help customers with their problems, but it was also a big architectural challenge. Because of the multitude of modular pieces in the instrument, the software itself needed to mirror that modularity. Each of the different pieces of equipment embedded in this product has an associated software component, and that led us to developing a component-based software architecture. 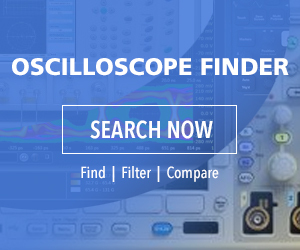 The new oscilloscope has a sleek, modern look. How did that come about? Steve Lafrance, visual designer: I’m involved in the industrial design and the user interface design, trying to take our current products, what we’ve been doing for the last decade, and moving it forward. This required a paradigm shift from things that were button driven to things that were more touch-screen driven. We’re going from small screen products to large screen products, and that just required rethinking everything we had, physically, on the outside of the box. Then, because we’re going from button driven, that required changes on the inside as well. Rob Kreitzer, mechanical engineering lead: One of the things that’s interesting for people to understand is fit and finish and providing that last polish to a product. In the end, it looks simple and elegant, but that’s what actually took the time, the focus and the engineering. One of the things I’m really proud of is setting the vision for creating a product that would look like a technical piece of art. The user interface on the 5 Series MSO is completely redesigned. What’s the story with the collapsible feet? Gary Waldo: During one of our many rounds of customer testing to develop the industrial design of this instrument, we had a model mocked up that weighed about the same as the final product. We asked the customer to get up and physically evaluate it. As he leaned the prototype forward, it collapsed on his fingers. So that was the impetus to say we’ve got to do something about these front feet that collapse when the scope is brought forward. With the new design, when there’s weight applied on the feet, they don’t collapse. As soon as the weight is removed, you can easily fold them back. What did you learn about the user interface from usability testing? Bridget Fisher, senior software engineer/user interface lead: When we first started, we had an outside consulting company give us ideas on how we should lay things out and recommend a font size, and we went ahead with that plan and used that information. Then in our first usability testing, we discovered that nobody could read the UI. People would come in and say I didn’t bring my glasses. Based on that, we increased the font size of everything, and the second time we had testing, nobody complained. We had one usability test where we didn’t allow the customer to use the front panel, a keyboard or a mouse. They had to do everything with the touch screen. When we first started this project, it seemed that the touch screen was kind of an “eh, we’re just doing it because it’s expected.” But with our testing we found out that customers really enjoyed using it. I was surprised to find out that there are customers who say one of their challenges with our previous scopes is they don’t have room for a keyboard or mouse. This frees up their bench space for other things. Considerable attention was paid to making the touch interface responsive – no easy task when working with live signals. How were you able to make the UI fast and responsive? Giao Tran, software and user experience manager: During early usability testing, we found that our customers expected to walk up to the touch screen and interact with it just like a mobile device, with pinch, zoom, and swipe gestures. We found that those gestures were challenging to implement because the software is operating on live signals and not just fixed objects. This required our engineers to be creative with improving waveform display algorithms to ensure the instrument operates smoothly with touch.